Wavo Springs are produced from round-section wire to provide higher loads while maintaining the accurate loading found in wave springs. As an alternative to Belleville Springs, the Wavo provides similar loads but with an accurate, predictable spring rate. Available from stock in 1/2" to 6” diameters. Free samples available. 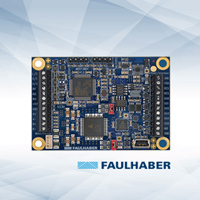 The new MCST 3601 series, developed by FAULHABER and motion controller specialist Trinamic GmbH, is a compact and flexible programmable motion controller ideal for use with the full range of FAULHABER micro stepper motors. The MCST 3601 is equipped with a micro controller & driver, and can actuate steppers in micro stepping mode. This capability is an excellent fit for optics applications where resolutions are often in the micrometer range. Decreases in Army spending and the shrinking of an active military force over the past several years have had significant impacts on weapons and equipment modernization. But engineers at Watervliet Arsenal in New York are finding new ways to create incremental upgrades to current systems with a super-tight budget in mind. 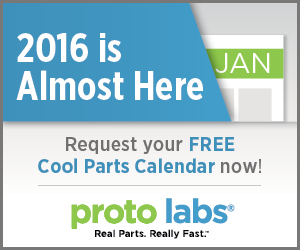 2016 Proto Labs Cool Parts calendar. Advanced Thermal Solutions (ATS) now uses advanced die casting technology to produce large heat sinks that cool stadium lighting and other large-scale outdoor lighting systems, including the University of Phoenix Stadium, which was the site of the 2015 Super Bowl (XLIX) and the first NFL field to be lit using only LEDs. Researchers at the Harvard John A. Paulson School of Engineering and Applied Sciences have demonstrated a way to make steel stronger, safer, and more durable. Their new surface coating, made from rough nanoporous tungsten oxide, is the most durable anti-fouling and anti-corrosive material to date, capable of repelling any kind of liquid even after sustaining intense structural abuse. The German Design Council awarded Continental's Hybrid Instrument Cluster the "Best of Best" award in the Automotive Brand Contest 2015 during the International Motor Show (IAA) in Frankfurt, Germany, on September 15. The hybrid technology theme runs throughout the entire design, blending analog indicators with a stunning and extremely versatile OLED information stream. Electroforms manufactured by Servometer are ideal for aerospace applications that rely on lightweight components that can withstand extremely cold temperatures and have tight tolerances. They also support medical applications, defense, semiconductor, energy, and the oil and gas industries. Just about any industry that requires custom sizes, unique materials, and specialty finishes will find Servometer electroforms the ideal solution. Learn more about Servometer custom electroforms for aerospace and medical applications. Selective laser sintering (SLS) is a close cousin to direct metal laser sintering (DMLS) but builds fully functional parts using engineering-grade nylon rather than metal. SLS needs none of the support structures typical with DMLS, however, and is essentially the only additive-manufacturing technology able to create living hinges and snap-fit assemblies. Gus Breiland, Customer Service Engineering Manager, Proto Labs, runs through some tips for designing with SLS in mind. 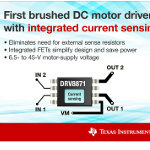 Texas Instruments (TI) has introduced a family of three brushed DC gate drivers featuring the industry’s first device with integrated current sensing. This novel solution uses a standard low-cost, low-power resistor to set the current threshold. The ability to limit current to a known level can significantly reduce the system power requirements and bulk capacitance needed to maintain stable voltage, especially for motor startup and stall conditions. The DRV8871 motor driver family helps reduce design complexity, power consumption, and board space in end equipment such as multifunction printers, appliances, and industrial machines. 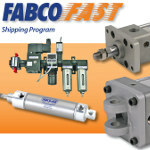 Fabco-Air, a leading manufacturer of fluid power products, has added the FA-Series Air Preparation product line to its Fabco Fast Shipping Program. The two-day shipping program includes: Four sizes (28 to 350 SCFM); 1/8-in. to 1-in. NPT ports; filtration rating options of 5µ, 25µ, and 40µ; lock-out/tag-out three-way valves; pressure gauges; mounting brackets; and accessories. Flexaust UL94V-0 Rated Hoses include 15 standard products that are made from neoprene polyester, PVC polyester, acrylic polyester, PVC, polyurethane, and thermoplastic rubber for a wide range of applications where worker safety is critical. 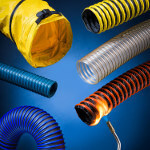 Featuring a choice of highly flexible and abrasion-resistant constructions, the extruded hoses are available in various wall thicknesses, and the fabric hoses come in single- and double-plies and several weights. Offered in sizes from 1 in. to 48 in. 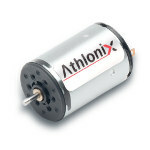 Athlonix 22DCP motors from Portescap are ideally suited for use in applications such as medical and industrial pumps, gas analyzers, security access, and power tools. These 22-mm-diameter high-power-density brush DC motors feature an energy-efficient coreless design with an optimized self-supporting coil and magnetic circuit, which ensures an optimum price-to-performance ratio. They feature continuous torque up to 6.5 mNm and higher stall torque than similar comparative motors. Athlonix motors are compatible with encoders and gearheads of various sizes and ratios and are also available on Portescap's online motor configurator called MotionCompass. With the explosion of military and consumer drone usage around the world, new anti-drone technologies -- from missiles to radio jammers to lasers that fry UAVs in the sky -- are rolling out to track, immobilize, and destroy flying threats. New findings at Oregon State University have overturned a scientific dogma that stood for decades by showing that potassium can work with graphite in a potassium-ion battery -- a discovery that could pose a challenge and sustainable alternative to the widely used lithium-ion battery. Launching humans to Mars may not require a full tank of gas. A new MIT study suggests that a Martian mission may lighten its launch load considerably by refueling on the moon. Auto Express presents its roundup of all the world debuts from the 2015 Tokyo Motor Show. See lots of way-out there concepts, a smattering of hybrids and electrics, and some real beauties too. G3DP is an additive manufacturing platform designed by a team at MIT to print optically transparent glass. The tunability enabled by geometrical and optical variation can drive, limit, or control light transmission, reflection, and refraction -- properties that could have significant implications for all things glass. The platform is based on a dual heated-chamber concept. The upper chamber acts as a kiln cartridge while the lower chamber serves to anneal the structures. The kiln cartridge operates at approximately 1,900 deg F and can contain sufficient material to build a single architectural component. The molten material gets funneled through an alumina-zircon-silica nozzle. The project synthesizes modern technologies with age-old established glass tools and technologies.